Since being welcomed into the Permaculture scene in 2015, I have been introduced to an array of topics. From grafting to canning, to soil remediation, and mushroom cultivation. The multitude of Permaculture techniques and discussions continue to fascinate me and grab my attention from the many distractions that the modern world has to offer. In November 2015, The Peanut Butter Palace was given permission to host what was Permaculture Orlando’s monthly meeting on the first Tuesday of the month. We were all extremely excited to have our new friends over for an evening of constructive discussions, laughter, and of course the sharing of delicious and scrumptious food. Our good friend and community member Chadwick Brown had mentioned “Biochar” during the group discussion and I can remember how confused I was as to what exactly he was trying to convey. Not to mention his brilliance and profound knowledge on all things traditional, the information he continued to share was like a foreign language to me. Anyhow, this was quite some time ago, and since then I have most certainly improved as a practitioner and have learned a ton from this amazing community. And of course, the many trial and errors involved in Central Florida gardening and Permaculture. 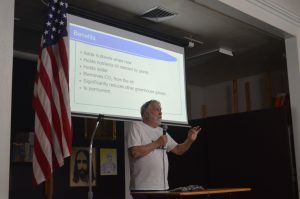 This article is meant to be a small introduction to April’s meeting on Biochar where our good friend Wae Nelson spoke on the subject and educated us on the benefits of this ancient and traditional agricultural technique. Wae Nelson presenting the many benefits of Biochar at April’s Permaculture meeting. 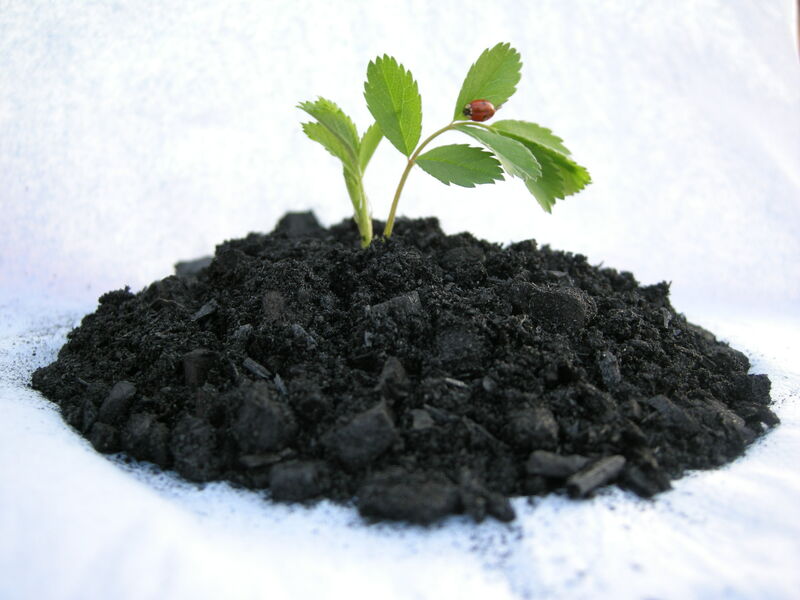 The creation of “The Biochar Initiative” was a result of the discovery of biochar or terra preta in South America. According to Dr. Mae-Wan Ho, “Terra Preta” was discovered in the Amazon Basin. At sites of pre-Columbian settlements (between 450 BC and 950 AD), it was made by adding charcoal, bone, and manure to the soil over many years. 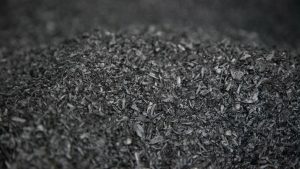 He also stated that “similar sites are found in Benin and Liberia in West Africa, in the South African Savannah, and even in Roman Britain.” Currently the the Biochar Fund is applying this technique as a solution for deforestation in Central America. In Sweden its use is being applied to tree planting and as a means for increasing soil fertility and when considering biochar as an agricultural technique or as a way to re-mediate your soil, you have to understand Carbon’s relationship to its use. As many of us know, Carbon is never destroyed, and when it is burned it will be released into the atmosphere. Burning biofuel will result in a large release of Carbon, one example you can consider is a forest fire for instance. Massive amounts of Carbon can be released during one, and this at times can be uncontrollable and also a natural process of some living ecosystems. Excessive Carbon in the atmosphere can contribute to adverse effects in climate, such as global warming. Also we have yet to fully realize the impacts of abnormally excessive amounts of Carbon and what impacts it can have on the planet years from now. However, ancient populations were able to develop a system that utilized the use of bio-fuel and minimized the impact it can have. According to Holly Godbey and the Permaculture Research Institute, “these ancient civilizations would dig into the ground and create pits where they would then fill with food scraps, agricultural waste and anything that would decompose organically.” This method would create the appropriate conditions for high levels of heat and very low levels of oxygen emission. It would reduce the amount of Carbon that could have been released into the atmosphere, and the material in these pits would also be covered with soil during the burning process which retained any excess Carbon and trapped it. However, there are also arguments against the use of Biochar. These arguments state that it could be more detrimental than helpful. For example, Dr. Mae-Wan Ho also wrote for the Permaculture Research Institute, that “the bio-fuels “boom” has already exacerbated climate change by speeding up deforestation and peatland destruction, loss of habitats and biodiversity, depletion of water and soil, and increased the use of agrochemical.” Certain initiatives focusing on the use of biochar plan to use larger areas of land specifically for the purpose of cultivating bio-fuel, then burning it to create biochar as a soil amendment and plan to distribute it in mass quantities. These practices could become unethical and counter intuitive, because of the intensive methods involved in the process. There is a lot more to say about this fascinating topic, you can find articles online as well as videos. You may run into opinions advocating the use of biochar, and others speaking out against it. Whatever the case maybe, I would say your best possible chance to learn about it first hand is to apply it to your own garden. 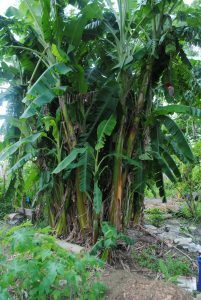 A few years ago when the Peanut Butter Palace Cooperative was in it first stages of development our banana circle was planted using biochar, and the results have been remarkable. It has become the spectacle of our garden, and most guests praise its height and immensity. We continue to harvest from our banana circle and this year has been one of abundance, as of today we currently have 3 stalks ripening. Justin is one of the executive directors of Orlando Permaculture. 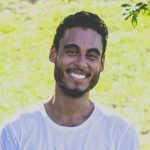 He is a 2 year member of the Peanut Butter Palace Cooperative and has avid interest in food forestry, medicine, and community initiatives.